Orange you glad your dorm room decor doesn't look like everyone else's? With our 3'x25" Orange Fir Tree with Mini Lights, it won't! You want your college dorm room to look one of a kind and express your personality all year round, including the holidays. Dorm room decorating for the holidays can be tons of fun, but there are also some concerns you have as you go through and decorate your college dorm room. You worry about the size of your dorm Christmas tree, and you also worry about your holiday dorm room decorations looking like everyone else's. Our Orange Fir Tree has got you covered for both size and unique style. Everyone's dorm Christmas tree is going to be green or white. What better way to make your college dorm room decor unique and make a statement than with an orange tree?! 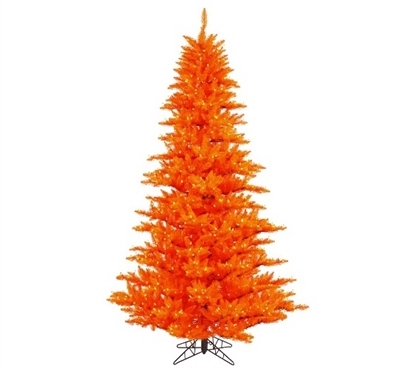 This dorm essentials item has bright orange branches that will create a unique look with your other dorm room decorations once you add garland and ornaments to complete your holiday decorations. Just when you thought the unique brightly colored branches were great, it gets better. Placed on the branches are orange mini dorm lights on orange wire, saving you time while dorm room decorating and also making your dorm Christmas tree really stand out and wow your friends! Plus this dorm Christmas tree is compact, making it easy to set up in a corner of your college dorm room without losing your dorm room storage space!